Pre-Requisites: Access Advanced Level 1 strongly recommended, as you should watch all of my classes in order. However, if you're skipping around, you should have at least completed the Beginner series and the first 3 or 4 levels of the Expert series where I start to cover functions. This class continues our exploration of Macros and Event Handling. We will begin with one of the more popular topics I get asked about: how do you open a form and go directly to a new record without using Data Entry mode? I'll show you how to do that with a macro. You'll learn about OpenForm and GoToRecord. Next we'll tackle another popular problem: what happens when you open a form with a subform (for example, our order form) and the user tries to add a CHILD record before there is a parent record in place? For example, they try to add a line item detail before there is an OrderID. This is a little more complicated, and we'll need to learn how to check for a missing Parent ID field, and use the GoToControl, SetValue, RefreshRecord, and GoToRecord commands to handle this one. 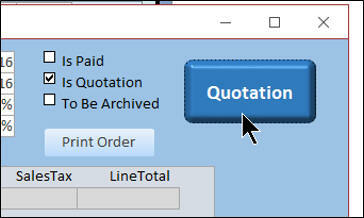 Finally, we'll design a toggle button where we can change the caption (and other properties) of the button so that it says "INVOICE" or "Quotation" depending on what kind of order this is. We have to learn how to dynamically change that caption for each record using the On Click Event and the On Current Event. 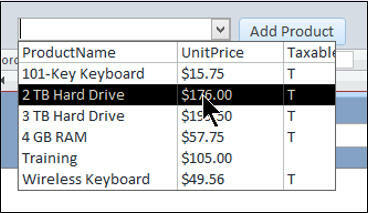 We'll learn about the Caption property, external macros, the RunMacro command, and the Enabled property. This is the 2nd class in the Access Advanced series. If you're serious about building quality databases with Access, and you want to learn how to automate your database with Macros and Events, which is a good pre-cursor to VBA programming then don't miss out on this course. Of course, if you have any questions about whether or not this class is for you, please contact me. Richard on 1/17/2017: I actually released Access Advanced 2 a month ago, but I never got around to posting the full outline on the web site, so only people on the Waiting List knew about it. For the rest of you, here goes... Access Advanced 2 continues our in-depth study of Macros and Event Programming. This is the 2nd class in the Access Advanced series. If you're serious about building quality databases with Access, and you want to learn how to automate your database with Macros and Events, which is a good pre-cursor to VBA programming then don't miss out on this course. Contents include: - Open a Form to a New Record - GoToRecord Command - Adding Child Records Before Parent - GoToControl, RefreshRecord Commands - Quote / Invoice Toggle Button - SetValue v. SetProperty Commands - On Click Event, RunMacro Command - Change Caption Property with Macro - On Current Event - Lots more Click here for more information on Access Advanced 2, including a course outline, sample videos, and more. This course was recorded using Access 2016, but most of the topics covered are valid for all versions of Access from 2007 on. This class follows Advanced Level 1. The next class in the series is Access Advanced 3. I have in my order form a sub-form that gets its record source from OrderDetailQ.The sub-form is where I list the products, qty, etc. (Add Product - button) Background- I run a convention that meets every year so each order is for that year 2016 now ordering 2017. When I bring up the order and enter the 2017 convention when I go back to my 2016 it shows everything from 2016 but no info from the sub-form (my products) How do I fix it? and when I do fix it, will I automatically recover the 2016 records that I already added the 2017 orders. (27 new 2017 records added so far). How is your relationship set up for year? Dennis O on 3/25/2017: I found my problem from the other question I just sent you about the convention. I notices that I had in the OrderDetailQ the criteria for convention (2016,2017, etc) was set at 2017 after removing the criteria, it works. Sorry about that.